The objective of this research is to develop an electronic model nose which has some of the capabilities of the human olfactory system. Humans and other animals possess considerable discriminating power in the olfactory sensory pathways. A trained ‘nose’ can easily distinguish between different complex odours for which there are minor differences in quantitative chemical composition, for example, batches of perfumes, brands of coffee or blends of whisky. Most of the current ‘electronic noses’ use chemically-specific sensors which are intended to detect a specific individual chemical. The human olfactory system is believed however to utilise only a small number of chemical sensors to discriminate between very large numbers of gases, odours and mixtures. The present project therefore uses a similar approach: the model nose uses a finite array of sensors (typically 3 to 64 sensors); the sensors are independent but each sensor is sensitive to a very wide range of odours. Odours are identified by an adaptive pattern recognition analysis of the signals induced on the sensor array. The system module which handles the signal processing is a sophisticated parallel-processing system which is used for the dual purpose of modelling the human olfactory system as well as providing an engineering solution to problems in olfaction. The main applications concern on-line quality control of food, drinks and perfumed goods, the detection of toxic and dangerous vapours, and in diagnostic medicine. There are three distinct lines of this cross-disciplinary investigation. These are the preparation and characterisation of transducer materials (electro-active conducting polymers and carbon doped non-conducting polymers); the structure-activity relationships and mode of action of odorants with the transducers; the construction and calibration of an array of microelectrode transducers which are synthesised as a single integrated circuit. A number of model noses have been successfully constructed and show considerable potential(an earlier first generation nose armoured for field work is shown here). 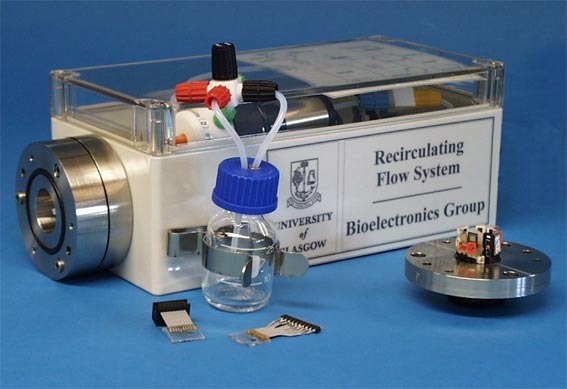 The model nose is also a prototype for a similar system which is being developed to detect general electrochemical signals in fluid and biological environments. We are currently constructing a second-generation electronic nose which has enhanced sensitivity and pattern recognition features. It is being applied to problems in agriculture and veterinary science (subject of a MAFF contract and involving The Silsoe Research Institute (Dr Toby Mottram) and The Royal Holloway Veterinary College (Professor C Wathes))..